My first thought when I closed the book was “This is what Game of Thrones in space must look like! 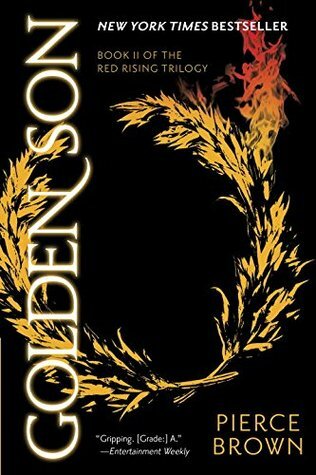 ” Golden Son was a worthy sequel to the gem that was Red Rising (for me): suspenseful, brutal and highly emotional! But it just wasn’t my type of book. The thing is, I stepped way out of my comfort zone for this one and I realized that Sci-Fi was definitely not my favorite genre. What made me love Red Rising so much in the first place was precisely its lack of science and its weird mash-up of tactics, duels, politics and ideologies with distinct primitive (the mines) and medieval (the Institute) feels that were closer to my usual book tastes. Some of those elements were still present in Golden Son. But while Red Rising was more Dystopian than purely Sci-Fi, Golden Son was an epic space opera but pretty heavy on high-tech terminology. Despite a highly charged beginning, I grew detached around the halfway mark simply because I couldn’t understand or imagine or immerse myself in the space battles. Luckily enough, Brown wrote a few amazing close quarter duels and fights. Coupled with superbly written characters, poetic description of death and destruction, relentless action and brilliant plot twists, they kept me interested until the last 100 pages happened -and what glorious pages those were!- and propelled the book from “objectively good” to “undeniably great”. 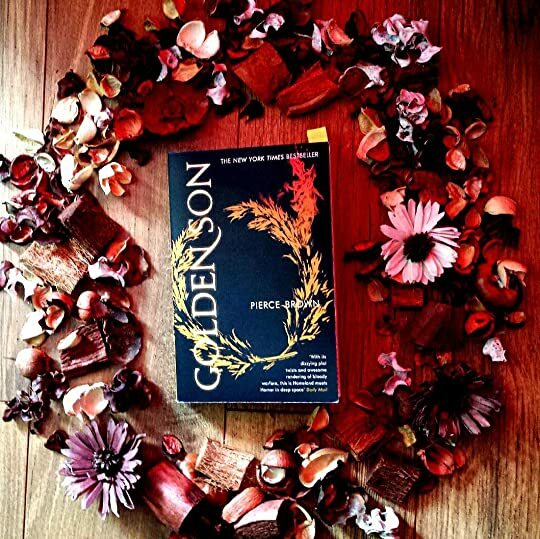 The themes and tropes tackled in Golden Son are some of my favorites in fiction: to which extent can we justify what is done “for the greater good”? How to transcend one’s birth and circumstances? The ideologies of the Golds’ Society were still horrifying in their coldness and efficiency. Because, what made them even more chilling and powerful wasn’t only their wealth, technology and weapons, but most importantly the believes they ingrained in the low- and midColors and by which they controlled them. The incorporation of Roman influence, legends and history lessons in this futuristic setting was extremely clever and compelling to read. Betrayal was ever present. Scheming, blades in the back and plans within plans will make you turn the pages until there is no more and you wouldn’t sleep before reading the first few pages of Morning Star! At least, that’s what I did! Because as soon as I closed the book, I just craved for more! If you’re a fan of gory, dark Sci-Fi and space opera, this book is just for you!! I couldn’t rate it more because of my dislike of the heavy tech vocabulary that made me struggle with almost half of the book. But I couldn’t fairly and objectively give it less either because it definitely was one intense, unexpected and epic ride! I totally recommend this brilliant series.